David Beckworth: "Miles and Scott's Excellent Adventure"
Alex Tabarrok made a similar point at an AEA meeting when he said the blogosphere has become the “first place for policy debate and policy development.” There are many examples of this, but here I want to recognize two potential solutions to the zero lower bound (ZLB) problem that got a wide hearing because of the blogosphere. These solutions were not new, but because of blogging and the personalities behind them, they became more widely understood and influenced policy. The two solutions are implementing negative policy interest rates via electronic money and nominal GDP level targeting (NGDPLT). Miles Kimball pushed the former while Scott Sumner was behind the latter. Both individuals first pushed these ideas in the blogosphere. Miles Kimball’s idea spread rapidly from his blog to other media outlets to central banks where he made multiple presentations to monetary authorities. Arguably, the Fed and ECB officials began talking more seriously about negative interest rates because of his efforts. Scott Sumner’s relentless efforts for NGDPLT also began on his blog and are considered by many to be the reason the Fed finally did QE3, a large scale-asset purchasing program tied to the state of the economy. Miles and Scott’s success is a testament to their hard work, but also to disruptive technology that is the blogosphere. I bring up their contributions, because they provide a nice conclusion to my previous two posts that looked at the ZLB. In those posts I looked at the claim that slump has persisted for so long because the nominal short-term natural interest rate has been negative while the actual short-term interest rate has been stuck near zero. It is stuck near zero because individuals would rather hold paper currency at zero percent than to invest their money at a negative interest rate. The ZLB is preventing short-term interest rates from reaching their output-market clearing level. The long slump is the result. Miles and Scott both have a solution for this problem. Unsurprisingly, both view the ZLB as a self-imposed constraint that can be easily fixed. There are two key parts to Miles Kimball’s solution. The first part is to make electronic money or deposits the sole unit of account. Everything else would be priced in terms of electronic dollars, including paper dollars. The second part is that the fixed exchange rate that now exists between deposits and paper dollars would become variable. This crawling peg between deposits and paper currency would be based on the state of the economy. When the economy was in a slump and the central bank needed to set negative interest rates to restore full employment, the peg would adjust so that paper currency would lose value relative to electronic money. This would prevent folks from rushing to paper currency as interest rates turned negative. Once the economy started improving, the crawling peg would start adjusting toward parity. More details on his proposal can be found here. Scott Sumner’s solution to the ZLB provides another escape route from the ZLB. His approach is to “shock and awe” the economy with a regime change to monetary policy that would catalyze a sharp recovery. This recovery would pull the natural interest rate back into positive territory and eliminate the ZLB problem. Scott would implement his “shock and awe” program by having the Fed announce a NGDPLT (or total dollar spending target) and credibly committing to do whatever it takes to make it happen. This amounts to the Fed committing to a permanent expansion of the monetary base, if needed. That is, a NGDPLT creates the expectation that if the market itself does not self correct through a higher velocity of base money, then the Fed will raise theamount of monetary base as needed to hit higher level of NGDP. If credible, this becomes a self-fulfilling expectation with the market itself doing most of the heavy lifting. In other words, the regime changewould spark a major portfolio rebalancing away away from highly liquid, low-yielding assets towards less liquid, higher yielding assets. The portfolio rebalancing would raise asset prices, lower risk premiums, increase financial intermediation, spur more investment spending, and ultimately catalyze a robust recovery in aggregate demand. It would be similar in spirit to what monetary policy portion of Abenomics is now doing in Japan. The figure below shows how Scott’s solution would provide an escape route from the ZLB. 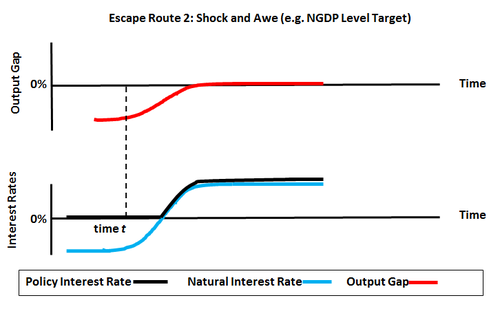 Like before, the figure shows a negative output gap and short-run nominal natural interest rate that is negative. At time t, Scott would have the Fed introduce NGDPLT. The output gap would begin shrinking and put upward pressure on the natural interest rate. Eventually the natural interest rate would broach zero and the Fed would have to start raising its policy rate in line with it. Finally the economy would return to full employment and the natural interest rate to its long-run positive value. The escape from the ZLB would be complete. So these are the two solutions to the ZLB problem. They have received a wide hearing and to some extent influenced policymaking because of Miles and Scott’s efforts in the blogosphere. Thanks to this disruptive technology and the conversations it started the world is a better place. 1. Bill Woolsey has a similar proposal. He wouldtransfer paper currency production to private banks and allow them to determine whether they want to produce paper money. Private banks would then determine the exchange rate between deposits and paper currency. 2. To be clear, Scott Sumner would do away with interest rate targeting altogether and his push for NGDPLT is more than about escaping the ZLB. It is about setting up a credible and effective target for monetary policy. I too am a big proponent of NGDPLT for this reason.